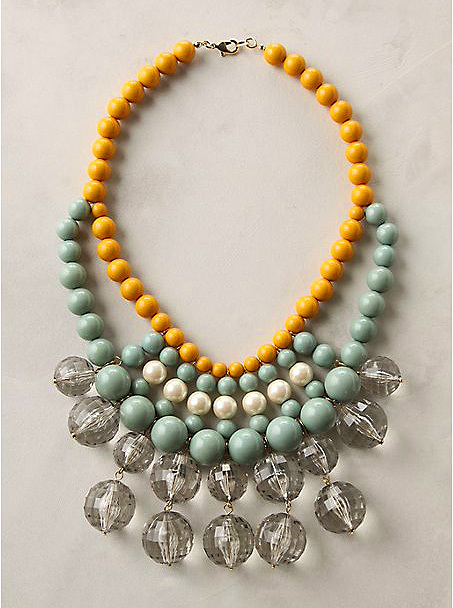 Online buy: Anthropologie's "New Growth Bib Necklace"
So I just paid Trina over at La La Lovely a long overdue visit and look what happened! I... click..click...click... bought this! And yes, the shipping to Australia cost as much as the necklace. Love that. PS (Trina can be seen wearing it with her fab new hair in this post). "Smooth beads and faceted orbs in the palette of shining sun, fresh spring leaves and sparkling dew." My sentiments exactly, Anthropologie. just beautiful! lovely colors! and it seems to have a beautiful sheen. It's lovely! That's the only bad thing about Anthro, the postage to Aus is terrible!